We are a leading Authorized Retail Dealer of work light strip and spot light series from Pune, India. Our company is engaged in offering a comprehensive range of WLS28 Work Light Strip. The high power solid state LED array designed for enclosure or area lighting, Illuminates a large area with an even pattern of light and no shadows; diffused window models available, Available in 6 different colors (cool and warm white, red, green, blue, and yellow), Rugged aluminum housing - sealed IP67 and IP69K models available, Lighted lengths available from 145 mm to 1130 mm, Stand-alone and cascadable; Cabled and Quick Disconnect; ON/OFF switch and non-switch models available and Low power consumption; less than 9 watts per foot. Our company is engaged in offering a comprehensive range of Spot Light Series. 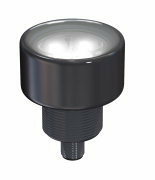 These illuminates a large area with an even pattern and no shadows, Low-cost, washdown spot light for Banner and other vision systems, Models available in rugged sealed housing rated to IP69K, Different lens options, depending on model to vary spot size; different colors available as well, Continuous or strobed operation; selectable Active High or Active Low strobe option, depending on wiring. Looking for LED Tube Lights ?